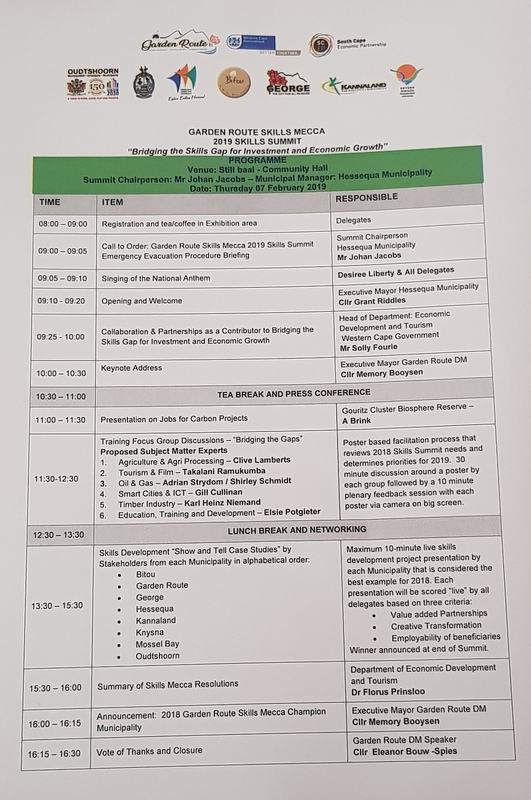 The Garden Route District Municipality, in collaboration with the B-municipalities in the district and the Western Cape Provincial Government, will be hosting the annual District Skills Summit on Thursday, 7 February 2019 in Stillbaai, a coastal town within the Hessequa Local Municipal region. This year’s summit follows a resolution taken at the 2018 Garden Route District Skills Summit held on 1 February 2018 in George, during which it was resolved to take the concept of a Garden Route Skills Mecca forward and review progress on an annual basis. The idea of a Skills Mecca originates from the Garden Route Rebuild Initiative (GRRI), which followed the devastating fires that hit the district (Knysna/Plettenberg Bay) in June 2017. Since last year’s summit, municipalities in the district, in collaboration with various stakeholders, among others, the Provincial Government, progressively worked together in order to bring about and implement the Garden Route Skills Mecca concept. The 2019 Skills Summit will focus mainly on the achievements of the previous year’s implementation of the summit resolutions. The “show and tell” (presentation/competition) will give municipalities an opportunity to showcase a project that was implemented within their respective municipal areas. 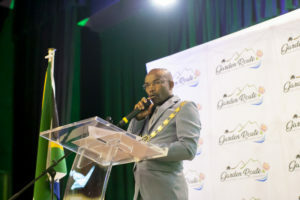 Another objective of the 2019 Skills Summit will be to discuss the progress of establishing the district-wide Skills Mecca made thus far, and also to evaluate the resolutions determined in 2018 towards making the Garden Route a preferred pristine destination for learning in the country and continent. considers Water – a Shared Resource. Engage with all willing partners, in particular the SETAs and the National Skills Fund, in order to explore the development and implementation of projects across the District as an integral part of the Skills Mecca. Did the partnerships in the project add value? – Yes or No? Did the project support transformation in a creative way? – Yes or No? Did the project make learners more employable? – Yes or No? The envisaged outcome of the Summit is to ‘’fine-tune” the resolutions from 2018 and develop ideas on how to accelerate implementation of the Skills Mecca in the Garden Route. The Skills Summit will be an annual event on a rotational basis; municipalities therefore also need to budget and plan towards this purpose. The 2018 Skills Summit attracted approximately 350 people and for this year, arrangements are being made to accommodate 250 – 300 people. For more information contact the GRDM’s Training and Development Section, Mr Reginald Salmons at 044 803 1363.